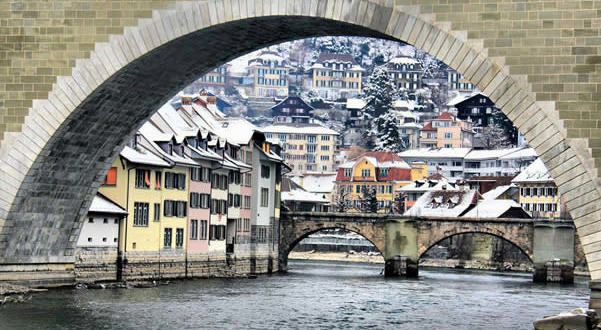 Bern, the capital of Switzerland, is located on a plateau along the Aare River. The historic part of the city is built in a meander of the river that surrounds it on three sides. The town has a beautiful old town, which was declared a UNESCO World Heritage Site. The Christmas Market is held in Bern Münsterplatz and Waisenhausplatz, two of the most beautiful squares in Bern. Packed with stalls selling typical Christmas products of Swiss craftsmanship as dried flowers, wooden objects, scented lights, jewelry. In the Christmas market in Bern you will also find many proposals of Christmas sweets and drinks such as hot cider, mulled wine, candy and gingerbread. 1) Christmas market in Waisenhausplatz (Berner Weihnachtsmarkts auf dem Waisenhausplatz). 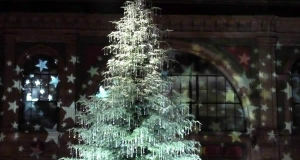 This is the classic Christmas market with gift items, Christmas decorations, toys and so on. This Christmas market has over 20 years of tradition, there are more than 50 wooden houses decorated for the holiday exhibiting a wide range of products. Visitors will find a wide selection of products from Christmas but everyday goods. Here you will also find the right gift or something for your wish list. Opening: 1 December – 24 December 2018.Opening Hours: from Monday to Saturday from 10.00 to 20.00; Sundays from 10.00 to 18.00. 2) Münsterplatz Christmas Market (Berner Münster Weihnachtsmarkt). The marketplace of artisans and artists of Bern takes place in front of the cathedral of the Swiss capital. This market has existed since 1984, and is notable for its diversity: there are in fact presented unique and original handcrafted pieces. Opening: 1 December – 24 December 2018. Opening Hours: Monday, Tuesday, Wednesday and Friday from 11.00am to 6.30pm. Thursday from 11.00 to 21.00. Saturday and Sunday from 10.00 to 18.00. On December 24th the market is open until 6.00pm.